Thanksgiving dinner can be a breeding ground for foodborne illnesses for the millions of Americans gathering this week. Simple mistakes, such as unsafe handing and undercooking of food, can make a whole table sick. The U.S. Department of Agriculture's (USDA) Food Safety and Inspection Service released five tips for a food safety. According to the Food and Drug Administration, 68 percent of cooks washes whole turkey before cooking it. USDA does not recommend washing raw meat and poultry before cooking. Washing raw meat and poultry can cause bacteria to spread up to three feet away. Cooking (baking, broiling, boiling, frying or grilling) meat and poultry to the right temperature kills any bacteria that may be present, so washing meat and poultry is not necessary. There are three safe ways to defrost a turkey: in the refrigerator, in cold water and in the microwave oven. Thawing food in the refrigerator is the safest method because the turkey will defrost at a consistent, safe temperature. It will take 24 hours for every 5 pounds of weight for a turkey to thaw in the refrigerator. To thaw in cold water, submerge the bird in its original wrapper in cold tap water, changing the water every 30 minutes. For instructions on microwave defrosting, refer to your microwave's owner's manual. Cold water and microwave thawing can also be used if your bird did not entirely defrost in the refrigerator. The only way to determine if a turkey (or any meat, poultry or seafood) is cooked is to check its internal temperature with a food thermometer. A whole turkey should be checked in three locations: the innermost part of the thigh, the innermost part of the wing and the thickest part of the breast. Your thermometer should register 165F in all three of these places. The juices rarely run clear at this temperature, and when they do the bird is often overcooked. Using the food thermometer is the best way to ensure your turkey is cooked, but not overdone. Cut the turkey off the bone and refrigerate it as soon as you can, within two hours of the turkey coming out of the oven. Leftovers will last for four days in the refrigerator, so if you know you won't use them right away, pack them into freezer bags or airtight containers and freeze. For best quality, use your leftover turkey within four months. After that, the leftovers will still be safe, but can dry out or lose flavor. Call the USDA Meat and Poultry Hotline at 1-888-MPHotline (1-888-674-6854) to talk to a food safety expert. 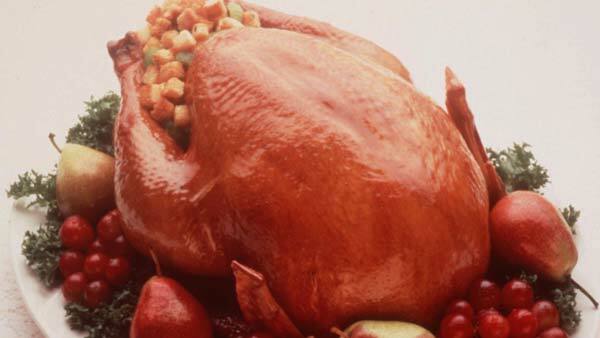 On Thanksgiving Day, the hotline is available 8 a.m. to 2 p.m. ET. Chat live with a food safety expert at AskKaren.gov, available from 10 a.m. to 4 p.m. ET, Monday through Friday, in English and Spanish.